John King Sr. lived in Grand Haven, MI where he started a small independent vault company out of home. John King Sr. moved his family to Muskegon when he purchased the local Wilbert Vault dealer in Muskegon in 1948. In 1983 West Michigan Burial Vault opened the crematory. This is the only crematory in the area that tracks and record the cremation process via barcode. 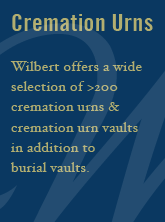 In 2010 they officially changed their name from Wilbert Burial Vault to West Michigan Burial Vault. West Michigan Burial Vault has currently 9 employees. Their services are offered in 9 cemeteries. The current owners of the company are John King Jr. and John King III – third generation within the business.